Katya Gotsdiner-McMahan, born in Russia, holds undergraduate and graduate degrees in organ and musicology from the Moscow Conservatory, including Doctor of Musical Arts degree in organ performance, Ph.D. in musicology, and a Master of Music degree in church music with organ emphasis from the University of Kansas. She has participated in master classes with Ludger Lomann, Jos van der Kooj, Olivier Latry and James Higdon. Gotsdiner won prizes at the First Kikta International Organ Competition (2005), the First Beedlaw Moscow Festival of the Young Artists (2007), the Fifth International Organ Music Festival-Competition “Gatchina-St. Petersburg” (2004), the Sixth International Organ Competition Marcello Galanti (2005, Italy), and the First All Russian Festival-Competition for Young Organists “Soli Deo Gloria” (2007). She has performed at concert halls and churches in Moscow and throughout Russia, as well as in Austria, Italy, The Netherlands and the United States. She has been featured on Russian state radio and television, including a performance with the Russian National Symphony Orchestra, and has performed and lectured about Russian organ music at the University of California Los Angeles, the University of Kansas, and in Amsterdam. 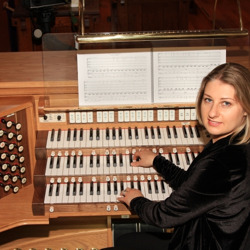 In June 2014 her lecture was featured at the National Convention of the American Guild of Organists in Boston. While previously living on the Central Coast of California she performed piano, organ, harpsichord, and celesta with the Lompoc Valley Master Chorale, North County Chorus, San Luis Obispo Symphony, Symphony of the Vines, Santa Maria Philharmonic, San Luis Obispo Wind Orchestra, and San Luis Obispo Opera. To learn more about Katya or to hear samples of her music, please visit her website by clicking HERE.